It seems so strange that Tom Cruise is a star (and a very good actor) and yet I can't remember the last thing I've seen him in something that hasn't involve some sort of mental meltdown (Oprah's couch, fighting with Matt Lauer, feuding with Brooke Shields). Was War of the Worlds really the last movie he made? I don't recall, but I do know it's been a while since I've seen him on the silver screen. No, I forget Valkyrie--how time flies. 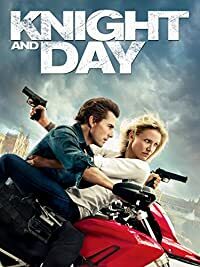 So, can I call Knight & Day a comeback? What I will call Knight & Day is a second-rate vehicle where everyone (including us) deserved better. June (Cameron Diaz) is headed home to Boston to serve as her sister's bridesmaid when she bumps and bumps again into Roy Miller (Cruise), a charming stranger. They board the same plane (after she was told the one she had transferred to was full), this one curiously having few passengers. June discovers that Roy has killed everyone on board because they were trying to kill him. She then gets caught up in Miller's espionage game. He is some form of secret agent attempting to stop Antonio (Jordí Molla), a Spanish arms dealer, from getting his hands on a Zephir, a powerful battery that provides an endless supply of energy. This battery was created by young genius Simon Feck (Paul Dano), whose life is in danger. Miller is being pursued by Agent Fitzgerald (Peter Sarsgaard) and their boss, Director George (Viola Davis), who believes Agent Miller has gone rogue. June and Miller are pursued through the States, Austria, and Spain by both Antonio and Fitzgerald to get their hands on this new creation. Knight & Day really has nothing going for it. There is nothing new or surprising in Patrick O'Neill's script. We pretty much know what's going on and the shocking twist isn't all that shocking. John Powell's score (specifically the use of the accordion to play French-style music) signals that this is a comedy, but I didn't laugh. My lack of chuckles came mostly from the fact that the movie treated June quite badly: she was drugged at least four times, and director James Mangold showed us her p.o.v. when she was under the influence often. Most of all, using this device allowed Miller and June to get out of various situations without actually showing us how they did that. It was a quick and easy way to get our characters out of danger, so it had the end effect (no pun intended) of not having to rely on intelligence to get out of things. Have no way out? Just drug your main character so she (and we) don't know how we got out of it. It's just so strange that for an action/comedy, Knight & Day has neither. There are action scenes, but they weren't particularly thrilling, and whatever bits of comedy fell pretty flat. The performances weren't all that remarkable. Diaz in particular was pretty awful. She has a monologue while in the airplane's restroom that shows she's trying to act but as filmed looked more like she was trying to memorize her lines than actually being a character named June. As I kept watching her all I could think of was Kristin Chenoweth would have been better in the role, and that's a terrible sign for a film when your mind starts to imagine another performer in a role and thinking that said actor/actress would have given a better performance. Chenoweth can be comedic, and while Diaz can be as well, the script, the directing, and her own abilities all conspired against her. Dano and Davis gave good performances, Davis especially so as the tough and determined Director, but unfortunately were underused. Again, it's a bad sign when you start thinking a movie would have been better if you had shifted your focus on supporting characters. Sarsgaard remains one of my favorite actors and it is interesting to see him trying to expand to essentially light fare compared to his better turns in such films as An Education, but oddly he appears to not be fully engaged in Knight & Day, almost as if you could read in his face that he thought he was too intelligent for all this. Molla also had little to do except be the typical raving villain, though it's nice to see the Hispanic villain be a Spaniard as opposed to Mexican, Cuban, or Colombian. It's certainly a shift from the last film I remember him in: as the excessively pious weakling Phillip II in Elizabeth: The Golden Age. The fact that he can shift from royal wimp to somewhat dangerous criminal is a good indication of his abilities, but not for his English-language career should he want one. Now, for Cruise. He can act, he can be funny, he can be the center of great action sequences. However, his character can't do any of the above. Miller is some sort of omniscient, omnipresent figure, always appearing out of nowhere and knowing things he has no way of being able of knowing, the type to be fifty paces ahead of everyone else. However, Miller isn't very interesting because we really know nothing about him. This is a fault of the script: he disappears from the screen for stretches at a time, so we are forced to move the story along without him. When he is there, Cruise does the best he can (the fight on the plane was good), and he has this offbeat manner to all the danger going on around him and a self-assurance that he, "has this under control". However, it isn't enough to push Knight & Day to anything wonderful. Side note: the logic of the film is a bit muddled. June does start out being taken into this against her will, but later she decides to join Miller in his escapades for no discernible reason other than he still looks good without his shirt at age 45. At least I didn't see why she would want to join with him, especially after risking her life in a blase manner and shooting her sometime boyfriend Rodney (Marc Blucas). Also, the backstory with the Knights (hence the title, although Day really didn't play into the film) is tenuous at best and isn't a big part of the overall story. Here's where I offer my own suggestion as to how Knight & Day could have been improved: role reversals. Have the super-agent be a woman (named Knight, not Miller), and have the man be taken hostage. The female agent, Knight, should be played by Kristen Chenowith, and the ordinary man played by Tom Cruise. It certainly would have been a stretch for both, don't you think? The man, Mr. Day (June's last name is Havens in the film), grows to action co-lead. How's that for a twist. However, that's not the film we get or will get. We have a pretty forgettable action/comedy that won't be in the canon of great Tom Cruise films. Knight & Day isn't by far a terrible film, but for an action/comedy, it's actually rather boring on both fronts. You can definitely wait to watch it if you want. It's best viewed at home, lying on a couch...assuming Cruise isn't there to jump on it while you're watching.